All about me activity- short interview, verbs ser, gustar and tons of cognates! 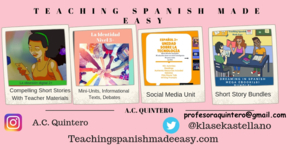 Ask Teaching Spanish Made Easy a question. They will receive an automated email and will return to answer you as soon as possible. Please Login to ask your question. I started teaching Spanish as a second language 12 years ago in an IB school in Chicago. I was fortunate to work in many different roles within my school as well as in the IB organization. This global experience has enabled me to reconnect with why I became a teacher and the greater role it plays in society; it also turned me into a writer. Since I had a difficult time finding appropriate reading materials for my middle school students, I ventured with my pen into the world of storytelling. It worked. I discovered the power of reading as goes the title of Stephen Krashen’s book. As an TPRS/CI enthusiast, my time is spent between teaching and writing. I am excited about what is next to come! It is my hope that the information, activities, resources and ideas shared on this platform will inspire teachers and motivate students to engage fully with the language process and become life-long learners. Please join me in this journey!